Chartio Review: "Easy to use dashboarding tool supporting many data sources"
We use Chartio as our dashboarding tool at Prezi. Everyone has edit access in the organization but mostly data analysts are creating new dashboards which are viewed by almost all departments. The most frequent dashboard consumers are product teams and marketing. Whenever we have a data question which has to be answered multiple times we usually automate it using Chartio. It is easy to connect your datasources and it supports over 15 different type of datasources. It is easy to create your first dashboards. You can learn the basics just by trying it out. It also has great documentation to find the solution for more difficult problems. You can save your data into Chartio's datastores. Using these datastores on your dashboards makes them super fast to refresh without querying your own database. You can set when you would like to refresh your datastores. I really miss usage statistics. We don't know who, when and how many times were viewing our dashboards. It is a real pain point when you have created hundreds of dashboards and you need to maintain those too which are not used any more. Would be nice to have version control to easily revert changes. Data-stores are limited to 1 million lines. Using multiple filters on a dashboards makes hard to fit into this limit. It you need to create a dashboard for your stakeholder to answer a data question this is a perfect tool. You can also add filters so the stakeholder can go a few level deeper into the data if needed. It is not appropriate for deeper analyses/modeling. Also would not use it for one-time reports. Chartio Review: "Great first time tool. We used it for a while, and eventually moved away." We purchased Chartio as an internal BI tool to provide teams external to the data engineering team access to reporting data. We did this for the purpose of ad-hoc analysis. We are a smaller company, so we used Chartio to build visualizations relevant to other teams that they can access and then use in their day-to-day. For example, we would build dashboards that the customer success team could use in their QBRs. In reality, it was meant for the entire org to use, but it ended up being used by engineering and product and consumed by other teams. Really easy to get going. We tested many solutions - and Chartio is by far, the quickest. Took us a legitimate 30 minutes from nothing to up and running. Chartio visually illustrates your database structure. This is phenomenally helpful for users who need to understand how to join tables and get the data they need. The UI is pretty typical of other tools, so there's not an additional learning curve if you've used other BI tools. It's actually more simple than most, but still pretty similar. Slow - the queries aren't optimized for speed. In order to combat this, you may need to build aggregate tables for date ranges and typical calculations. Expensive. We negotiated down to $25k a year. That's pretty typical for BI tools, but the value ended up not being equal to $25k. It's a good tool if you're new to data. It's 50/50 if I would recommend it. I really liked it, but ultimately we didn't get wide adoption. A few reasons for this are that our exec team needed something simpler to interact with. Database tables were too complex for them to interact with and so they asked that we move to another tool. Review: "Chartio - User friendly and powerful dashboard creation"
We use Chartio to channel the robust social media data we have in our databases to create client-facing dashboards for certain brands we manage here. The dashboards we create are interactive, meaning the client can filter by various different criteria depending on what their business goals are. These dashboards in many cases stream into other reports that get sent to top management, or are even used on their own sometimes due to their easy and appealing user interface. Chart manipulation after an initial query. Extensive choices for dropdown menus. User interface is very easy on the eyes and intuitive. The new drag & drop method for arranging charts is much more efficient than before! I'd like to be able to see two dashboards at once. Sometimes I do find myself limited by the chart types - not quite as flexible as Excel would be. I think Chartio is flexible enough where it can be used in any business scenario. It happens to work very well with what we do in the social media advertising scene where we focus a lot on growth trends and engagement patterns. User Review: "Chartio is our real MVP"
We use Chartio as our business dashboard for the leadership team. All critical aspects of the company performance are dashboarded by department for all leadership to coordinate on KPIs. Previously, we would have ad hoc reports from different line of business software applications that may or may not have been inclusive of all the metrics and only the metrics we cared about. Chartio gives us one place to go to measure the company. If you have a very specific data visualization in mind, ensure their chart types achieve what you're looking for. If you have external constituents and you don't want to share the entire dashboard, or you want to white label the charts/dashboards you'll have to wait for these features to develop more. Chartio Review: "Very valuable, while still evolving." Access to data...weekly leadership team scorecard, program performance, etc. I really use chartio for all of my reporting needs now, primarily b/c it's so much more efficient than our other options. I'm not sure chartio is great for the average/below average user if you're asking them to build their own charts/dashboards. Review: "Love Chartio! Unpolished look at our take"
It is used across our whole organization to easily and quickly understand actual data all in one place, all comparable to each other in infinite ways. Doing this with Chartio makes it so much quicker and more realistic to find the answers to so many questions. Building visualizations without technical knowledge; I don't know of any other way to do this as easily with anything other than social media stats. Good customer support - Chartio has incredible potential, but sometimes it can be hard to know how to get what you want, and their support makes that possible. Design - they handle a lot of information and options and it's very easily for that to get complicated and bogged down, but their design is clear and concise and lightweight, allowing you to see things clearly. Navigation; there are a lot of repeated process for using the tool and there is a lot of wasted time required to re-organize things or move around properly. More shortcuts or docs or smart suggestions to help you achieve the more complicated processes that are possible without having the full technical understanding, the way the drag and drop does for the basic stuff. Linking to a particular chart is still not great because you either send someone to edit mode (don't want that) or to a page full of charts, and while it's highlighted, that is not sufficient for the average person. I would say: What is it that you really need and/or want? Are these things that are immediately achievable with Chartio? What are your other options, and which one is going to get you the most bang for your buck? Chartio is great for a company without the technical resources to do their own graphing. User Review: "Chartio for Education"
We're using Chartio to track progress through our course platforms. Our team is more of an R&D focused team, so we have built a number of course experiences to show how online education of the future could be more effective and engaging. As part of that, we track our metrics using Chartio, and also use Chartio to report back to our customers their own employees results in our platform. Directly connect to the actual data running our site. Allow for advanced querying, filtering, and even user based permissions to see and edit the data. 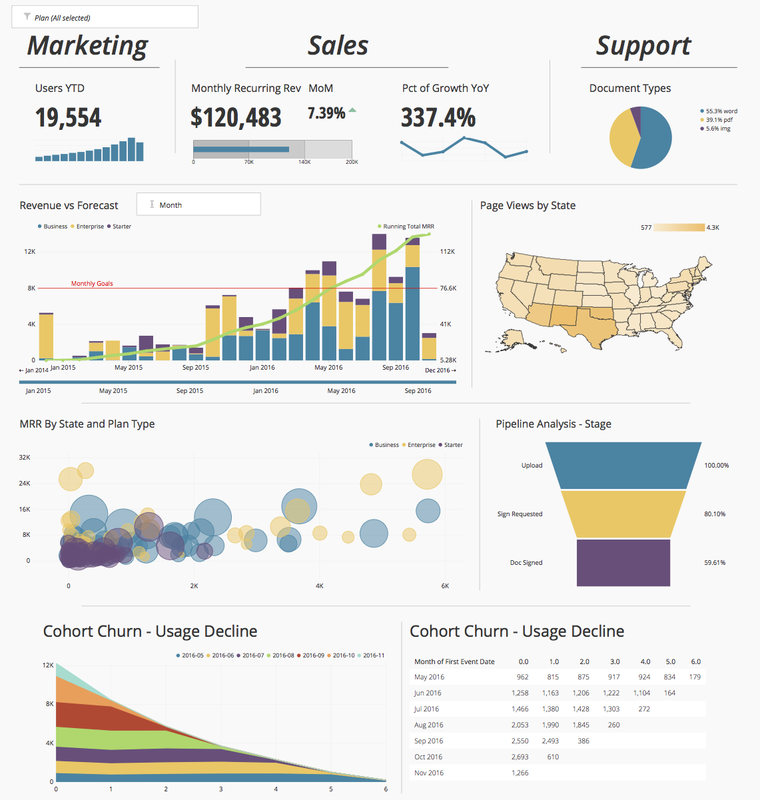 Provide a great way to layout and communicate the data in visualizations and dashboards. Chartio is beginning to add more statistical analysis tools into their platform, but for now this is somewhat lacking. Dashboard level filters have come a long way in helping to get to the data that is really important, but there are some challenges we've had with more complex queries where we'd like to filter certain things completely out of our data for every single chart, and that one use case has been a challenge. 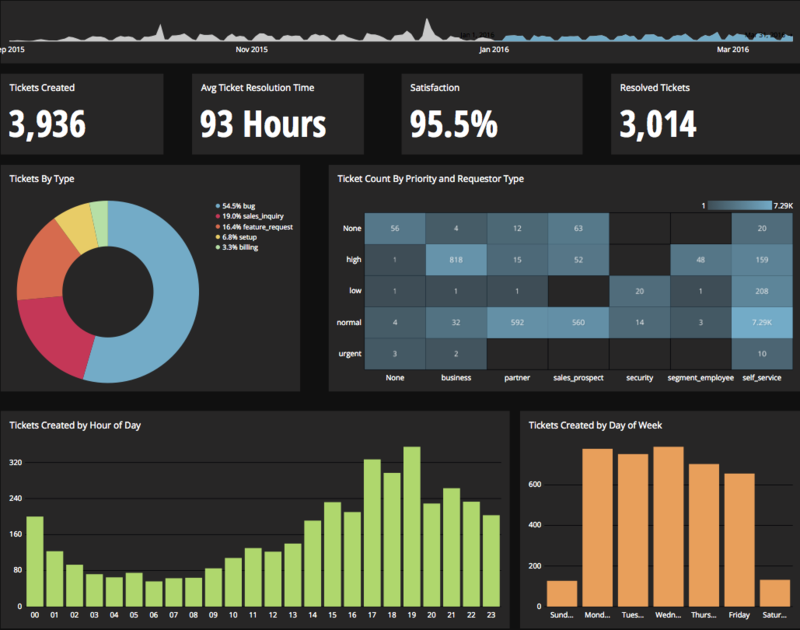 Chartio is a great tool for building presentable dashboards. It can export, you can add read-only access, and it has permissions levels by dashboard for users. There are other data analysis tools that help to analyze the data, but few allow for such a nice presentation. Chartio Review: "The tools that solves the BI for the companies that doesn't hate the resources to hire dedicated BI resources but badly need it." It's mainly used to analyse the marketing expenditure and get on top of the CPO and the sales per month. Chartio is a very agile tool where I can easily build the report I want. It's easy to load data from both offline and online sales. I would say that this is the number one BI tool compared to other BI tools I've used. Intuitive for reporting and analysing on the fly. Can perform calculations in tables and in the data cells instead of pre-processing the data elsewhere and not only using the Chartio tool as a tool for viewing data. Not passive but active reporting and analysing which makes the tool a good core tool in any corporate BI suite. Chartio has a lot of usable diagrams for viewing data from new perspectives which makes our business decisions much wiser than they would be otherwise. With Chartio it's easier to have the right data at the right time for the best possible business outcome. If you have connected to a simple MYSQL-database which has a limited amount of requests, perhaps be able to send the database requests in sql instead of all of them at the same time. Especially if you have a dashboard build with a lot of single number KPIs. Chartio doesn't necessarily require outside expertise which could be a hidden cost when investing in other BI-tools. Investigate how you as a future Chartio user can save a bundle by using an easier and more user friendly back-end and administration process. User Review: "Basic Chartio User"
Chartio is being used to track our metrics for each city that we operate in. It is being used by our regional managers to help track different sets of data across the board for individuals that work with the company as well as segments of different markets. Able to export large amounts of data that can be easily used in different platforms. I think Chartio gives valuable information in a clear and concise way that is easy to read, interpret, and export. Chartio Review: "Easy For Metrics"
My department uses Chartio to display performance metrics. This has led to employees seeing that the time and effort they are putting in is showing for something. How easy it is to display charts and metrics has made it much easier to show employees immediately what their progress is compared to their co-workers but also over a period of time. As a manager it has made it very easy for me to understand my employees' productivity as well as identify quickly areas where we have needed to address improvement. Metrics charts are a huge strength with this product. At Workiva, we are currently using Chartio to display KPIs and other research metrics in a dashboard format. The dashboard format makes information easier to consume on a regular basis, as well as, presenting during sprint reviews. The product is currently being used by our Product Management and User Experience teams, other departments are considering the tool for their own purposes. Constantly updating: many of the BI tools we looked at were slow to iterate on their product. This was a main selling point for us. Ease of Use: We have many users that are new to BIs tools and database management in general. BI software as a whole has a pretty steep learning curve for most people, but Chartio does a good job of making things easier all around. Database Support: It seems as though every department insists on storing their information using different databases. Chartio had support for everyone one we needed which was very helpful. Limited in-depth functionality: In speaking with our Data Science team, it seems Chartio is limited when it comes to more in-depth BI features. An example is the lack of ability to have complete control over queries: how often they fire, when they fire, which charts can refresh when, etc. Chartio has been improving on this, however. Limited Google Analytics control: In my speaking with the Chartio CSMs, this seems to be more on Google's end. Examples: The API doesn't fully pull in custom dimension names and query limits seem to still be imposed even though we have GA premium. Chartio does attempt to give workarounds like letting you rename the custom dimensions until they roll out a permanent fix. Our Data Science team currently uses Birst due to it's micro level control. If you're in a situation where you want inexperienced users taking a larger part in managing their dashboards, I would highly recommend this product. The usability of this product and their frequent updates to improve problem areas are just leaps and bounds above everything else we looked at. Birst did release a beta "wiziwig" type interface that was easier to use than the original interface, but it was still pretty far behind Chartio in terms of performance and appearance. I like the fact that I can filter the data by a variety of different verticals. I also like that I can view the data for each campaign very quickly with a minimal number of steps. However, I cannot see the sites that are affecting delivery of campaigns immediately on the platform so I have to use other platforms to implement the information I get from Chartio. I also can't see live delivery so I have to wait until the next day to know whether changes I've made have had the desired effect. We can now optimize campaigns more efficiently as it is now easier to pull the data we need. We also now have a better idea of which campaigns most affect delivery and performance. Filtering data by vertical - this allows the user to see the effects of different data points. The ability to pull the data on to an Excel sheet - this allows further manipulation of the data and by the addition of formula etc. Different dashboards allow the user to view the data in different ways different users may be fond of one view over another. Inability to immediately act on data from Chartio through Chartio's platform means we have to use other software to implement information gained from Chartio. Data gained isn't live this means we can sometimes depending on the quarter be acting on less relevant data and we also cannot be as reactive because we have to wait a day before we know if our changes made based on data from Chartio is successful or not. Chartio is very well suited to data analysis as it allows you to visualize and manipulate data very well. User Review: "Chartio is at the top of my chart!" We use Chartio in several ways at our company. We use it to provide great amounts of data to our clients to help provide better business solutions for their use of our product. I also use it to find information about users in our database by building multiple queries to mine for great detailed results. I think Chartio is great for finding particular information within a large pool of data points. Review: "Very happy with Chartio - saves internal resources and time." We use it internally for several things. We use it for internal management dashboards with core metrics across the entire organization. We also use it to analyze different data sets and sources without having to resort to CSV output and Excel modeling. It helps us reduce engineering overhead in building out custom dashboards, and also have real time access to critical information. Chartio is great for replacing internal dashboards for sure. We use Chartio to get daily reports and insights about what the data looks like. It generates BI reports for us based on the data that we have. It affects the performance of our DB machine so we had to run it on a replica, I guess this can be solved by running more processing on Chartio's machines instead of our own. I guess any SaaS company will need to have a BI software, and for us, Chartio has been great! Chartio Review: "Simple to use and gets the job done, but needs some polish"
We use Chartio to create dashboards that show live-updating information on our products - these are circulated to key stakeholders via email, displayed on live screens around the office, and used directly by power users within the development and product management teams. Our organization currently has 10 seats for Chartio. We try to have 1 person in every department have a login to see the information relevant to them. It helps us measure our data metrics that are apart of our OKR's. It is also used by the Analytics department to quickly visualize and tweak written queries. Simplicity for certain team members that do not have experience writing SQL code. Allows them to simply drag and drop for the easiest of queries rather than having an analyst find time to write one. Quick visualizations of written queries with a good amount of choices for different charts. It's easy to test a query in terminal and drop it into chartio to get a quick visual. Partitioning dashboards so only certain users can view or edit them. I've built upwards of 15 different dashboards in Chartio and some of the information isn't always privy to certain departments. Seat licenses for an entire organization which are then limited to a max of 10 users in the product at a certain time. If an 11th person wants to view something, they will get a pop-up that says the max amount of users are currently using Chartio, please wait until one of them exits. Or give a list of who is currently viewing. Auto formatting of numbers within a set of space defined by the vertical/horizontal rulers. Chartio is very good for the price. Right now I would say it's great for startups. It would need better permissions management and faster processing to be more viable for large corporations. I could see it being used by one-off groups in larger companies. Chartio Review: "Simple, intuitive tool for data reporting/visualisation"
Review: "Chartio: a pretty good dashboard app that is probably the right choice for you"
It is used as a quick reference for our top level business goals. It is mostly for the benefit of execs, though it is used throughout the company. If the question is "is [KPI] trending up or down?" the answer is usually on Chartio. Good selection of visualization types. Easy to use, without a lot of unnecessary features tacked on. Limited ability to control when charts update. We've seen issues where loading a single dashboard will cause all charts to update simultaneously, swamping the DB. User management controls are a bit crude. Adding/removing users and managing dashboard permissions is not trivial. It is a very solid dashboard app. If you want to keep track of data from an analytics platform or SQL database, Chartio is a good solution. If you want to do data exploration, this will not suit your needs. Review: "Chartio reports have become core to our decision making"
We use Chartio across the whole organization to understand our business metrics in real-time. Updates existing business analytics reports automatically. Makes it easy to create new reports on the fly. It would be nice if the graphical interface could do some things that currently require SQLite code. Make sure that Chartio can integrate with your most important data sources. Chartio Review: "SQL powers with little SQL knowledge"
Chartio: "Useful tool for sharing and reviewing performance metrics"
Across the organization. It helps us do performance reviews / reports for internal and external purposes. User Review: "Getting chartty with Chartio"
Chartio is used in the technology department as an analysis tool for our product. The graphs are also sent out in monthly product news since it displays data so nicely. Is your data being updated on an hourly/daily basis? It's a great way to make SQL pretty, and great for team dashboards and goal tracking on the wall monitors. Also, the Chartio support team has been very helpful and new features are frequently rolled out. I use it primarily for productivity tracking of off-site team. For alerting suspicious activity by online customers. And we have an wall display of KPIs across all businesses being managed, and milestones to celebrate. It's particularly easy to use query mode, take simple SQL, and publish it in a much more attractive way. Chartio Review: "Tailor Made Dashboards"
Chartio has been absolutely transformative in our organization. As a bespoke tailors, we focus on the fine details on making beautiful garments for our customers and let Chartio focus on the big picture! Each of our tailors receives a Chartio report each day, with a summary of key production statistics. Its made a very traditional process modern, dynamic and lean. I couldn't imagine life without Chartio! SQL to Charts - if you've got data stuck in a database, Chartio makes it sharable. Business Intelligence - Want to know how your production is doing? Using drag and drop you can ask your database questions. Chartio's PDF reports via email sometimes are incorrectly formatted. This has much improved lately! If you've got a SQL database that tracks sales, production or marketing productivity, it's a must-have. If you don't collect data in a database, in a consistent way, business intelligence software isn't for you - Chartio cannot reinterpret inconsistent data. - Is your data consistent enough for analysis? - Is it in a database? Chartio has built a visual version of SQL, which is designed to enable anyone to explore, transform and visualize data on the fly through a single, intuitive, flexible, drag-and-drop interface. The vendor’s value proposition is that with their solution, there is no need to build a data model in advance, thus allowing for more agility and ease of manipulation. Additionally, the vendor says because Chartio is built on SQL, there’s no need to learn a proprietary language.